billion in the year to December 2017, up 6%. While the generally accepted definition of tourism presented above means that there is vast array of activities, Tourism Australia focusses on four main industry sectors. These include Youth, Nature Based, Cruise Shipping and Business Events. Tourism Australia defines the youth segment as people aged between 15 and 29 years. The youth market contributes 25 per cent of all visitor arrivals to Australia and 46 per cent of all visitor spend. For the year ending December 2017, youth arrivals increased by 6 per cent to 2.2 million, while youth visitor spend reached $18.5 billion, up 6 per cent for the same period. Nature-based tourism forms a significant component of Australia’s visitor economy, ranking among top travel motivators for international visitors to the country. Nature-based tourism is leisure travel undertaken largely or solely for enjoying natural attractions and engaging in a variety of nature-based activities – from scuba diving and bushwalking to simply going to the beach. In the year ending June 2017, 69 per cent (or 5.4 million) of international visitors engaged in some form of nature-based activity. The top international nature-based markets were China (17 per cent), the United Kingdom (10 per cent), New Zealand (10 per cent) and the USA (9 per cent). 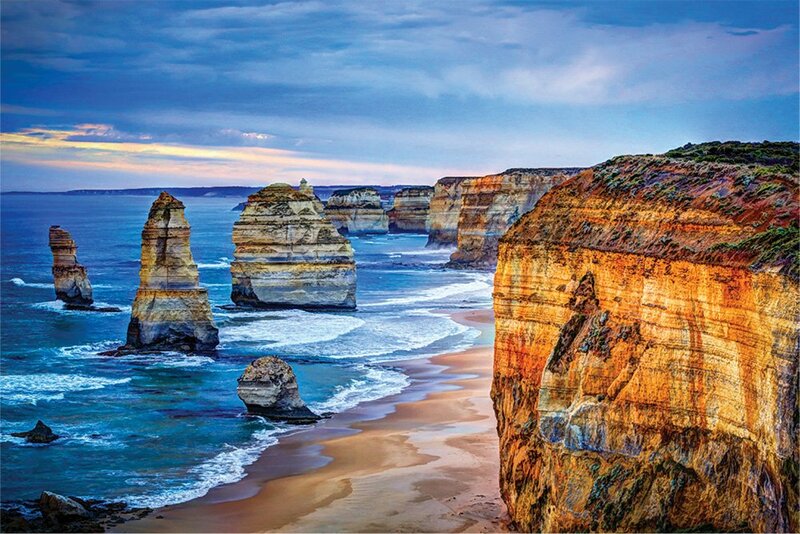 Australia’s biggest strength is its world-class nature, well regarded from all markets and core to our global tourism offering. Tourism Australia’s research across 11 key markets shows aquatic and coastal experiences are among the greatest drivers of international visitor demand, with two out of three international visitors enjoying Australia’s aquatic or coastal environments in some way – from scuba diving to simply going to the beach. This sector plays an increasingly key role in the Australian tourism industry. All the world’s leading cruise lines include Australia in their programs – ranging from expedition style cruise lines and mid-range ships, to mega ships and up-scale lines. The estimated total output of $2.893 billion in 2015-16, including direct expenditure of $1.737 billion. This was a 10.2% increase from 2014-15 when total output was estimated at $2,624 billion. The estimated employment impacts of 13,512 full time equivalent positions (FTEs), including 9,422 direct positions and 4,091 indirect positions. This was an 12.7% increase from 2014-15 when total employment was estimated at 11,992 FTEs. In addition to employment generated by onshore spending when at port, it is estimated around 1,500-2,000 Australians are employed on cruise ships, mainly in the ports where cruise ships are based such as Sydney, Melbourne, Brisbane, Fremantle and Cairns. The estimated total value-added impact of $1.377 billion, including a direct impact of $874 million. This was a 10.3% increase from 2014-15 when total value added was estimated at $1.248 billion. Business Events are major contributors to the Australian visitor economy. On average, international business events visitors spend on average twice as much as leisure visitors during their trip to Australia. 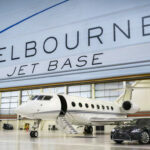 In addition, business events provide benefits to Australia beyond the economic. They showcase Australia’s capabilities in event delivery and key knowledge sectors, develop trade and investment relationships, and are catalysts for information sharing. In addition, business events provide a platform for international visitors to extend their stay in Australia for leisure purposes and establishes strong connections that can lead to return visitation to Australia in future. Each of these sectors is supporting the overall ongoing growth, as shown in the chart below in short term visitor arrivals. 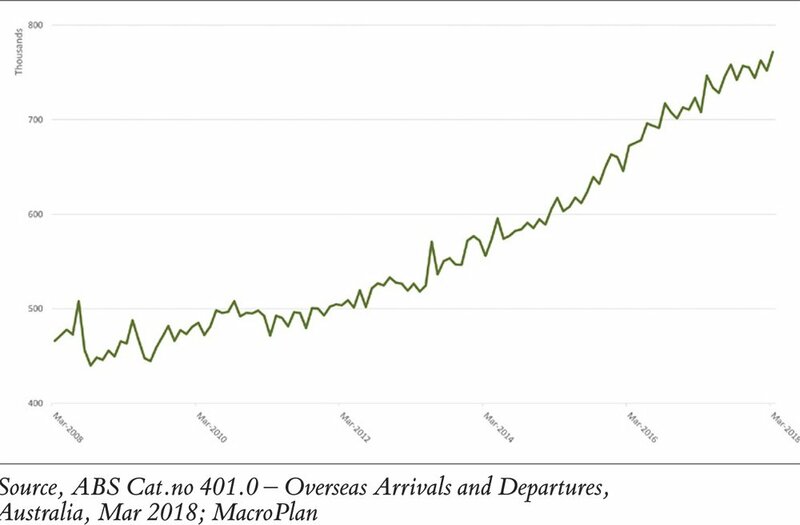 In trend terms, short-term visitor arrivals to Australia during March 2018 (761,800 movements) increased 0.4% when compared with February 2018 (758,700 movements). Currently, short-term visitor arrivals are 5.3% higher than in March 2017. When trend estimates for short-term visitor arrivals for March 2017 and March 2018 were compared, the highest percentage increases were recorded for India (19.7%), followed by Hong Kong (10.7%) and China (6.8%). The highest percentage decreases were recorded for Malaysia (-1.9%) and Singapore (-0.6%). In terms numbers, the major growth market in recent years for Australian Tourism is China. The top five destinations for Chinese leisure visitors include Sydney, Melbourne, Gold Coast, Tropical North Queensland and Brisbane. As in terms of activities, Chinese leisure visitors like to engage in activities such going to the beach, shopping, and experiencing authentic Australian nature. 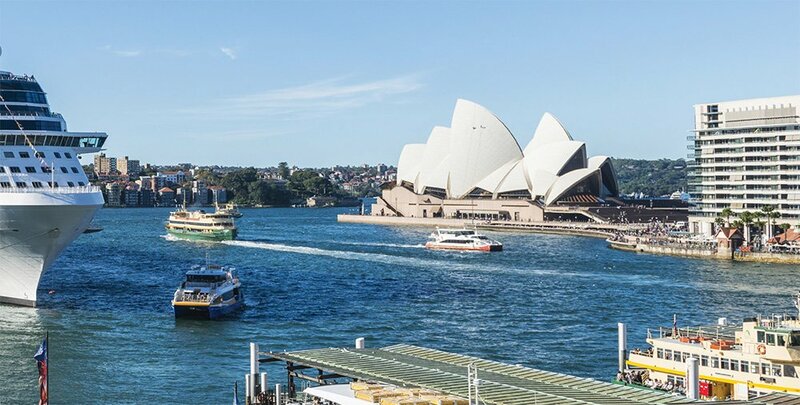 The ABS figures showed that more Chinese visitors came to Australia than from any other nation with 1.41 million Chinese tourists visiting Australia in the year to March 2018. The next highest group is New Zealand, with 1.36 million tourists. Total short-term visitation was just under 9 million. The annual growth rate for Chinese visitation is 11.3% compared with the overall total visitation achieved by all nations of 6.3%. It is certain that the future tourism opportunities provided by Chinese tourists, many of whom were on return visits, represents an exciting prospect for the industry. It is also likely that with an increased access that higher levels of visitation will be achievable. Presently it is possible to fly direct to Australia with 10 different airlines from no less than 17 different cities in mainland China. Increasing capacity at Australia’s key gateway infrastructure is necessary to accommodate increasing levels of visitation. Brisbane Airport’s new A$135 million expansion of the northern International Terminal and apron was officially opened on 23 April 2018. It represents one of several sea and airport major infrastructure projects underway of planned to accommodate growth over the coming decades. The project also delivered 55,000 square metres of new pavement, new aircraft taxiways and three new aircraft parking bays. The terminal and apron expansion were just one part of the airport’s A$3.8 billion infrastructure program designed to meet future growth, and position Brisbane Airport as the nation’s preferred gateway airport. Presently the overall outlook is positive, reflecting both the increased demand for rooms off the back of growth in the domestic and international visitor markets, and the historically lower levels of new supply. Revenue Per Available Room (RevPAR) in recent years and is expected to continue to rise. Deloitte Access Economics expect room nights sold to grow over the next three years at 2.7 per cent per annum, and national occupancy rates to climb to 70.8 per cent by 2019. Revenue per available room is forecast to grow by 3.1 per cent over the next three years, and average room rates are expected to increase at an average of 2.5 per cent over the same period. From an investment perspective, compared to other property types, hotel investments have tended to perform favourably over the last ten years. The risk return profile of hotel assets was generally superior to that of other asset classes, having similar volatility to industrial and office assets, however, considerably outperforming with higher returns. According to CBRE’s latest hotels research, the last quarter of 2017 saw over $400 million worth of hotels transact in Australia, but this was not enough to stop 2017 recording the lowest national sales volumes since 2011.
effect on the market as they absorb the large influx of rooms. More stable markets, such as Canberra, Cairns and Adelaide are enjoying a period of increased performance due to the minimal increases in supply. For Australia to remain competitive a high and sustained level of investment in the industry, its supporting infrastructure and training in the industries workforce will be essential. It will also be important to encourage and develop other segments such as its adventure tourism offering. This is a tourist activity that includes a physical activity, a cultural exchange, or activities in nature. It is a type of niche tourism, involving exploration or travel with a certain degree of risk (real or perceived), and which may require specific skills and physical exertion. It can be a type of tourism, involving exploration or travel to remote, exotic and possibly hostile areas. Places in Australia such as the Tully Gorge in Queensland’s Far North, Lamington National Park on the New South Wales and Queensland borders and Cradle Mountain in Tasmania are examples where world class adventure tourism can be delivered and evolve to cater to a larger market share. Representing a diverse mix of experiences, events and activities, tourism is one Australia’s key industries. Its outlook looks positive. However ever-increasing investment in the accommodation sector, its people and supporting transport infrastructure and constant innovation in the services and experiences on offer will be essential for it to remain relevant and to prosper in a global market. If you interested in understanding more about the Australian tourism industry and the current opportunities within this sector, please contact the author Mark Courtney, General Manager – QLD, via mark.courtney@macroplan.com.au or on 07 3221 8166.